Fireworks can be extremely dangerous when not handled properly: these tips will help you and your family stay safe. There are some things that you need to be aware of if you are going to be building your own bonfire. Firstly, you need to ensure that it’s not too high, is away from fireworks and that it’s also stable. Don’t put fireworks, even if they appear to be faulty, or rubbish such as aerosols, on the bonfire. Also, make sure you are not building it underneath cables, trees and keep them well away from buildings and fencing. Secondly, immediately before you light it, you need to ensure that there are no animals or even children hiding in your bonfire. Never light it using flammable liquids either as this can result in an uncontrolled spread of fire or even an explosion. 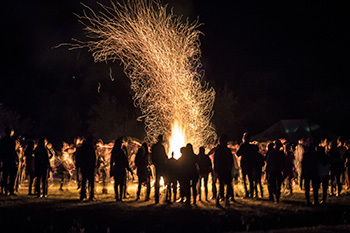 Thirdly, ensure that you put the bonfire out completely when the event is over. Double and triple check that everyone has left before putting it out. Sparklers are great; children can have lots of fun making shapes and writing with them and you can get some lovely photos of them doing so. Ensure you always wear gloves when holding a sparkler as it significantly reduces the chance of getting burned. Sparklers are very hot, even when they have gone out, so dispose of them safely by either placing them in a bucket of water or sand until they have cooled right down. You must also keep them held at arm’s length. However, children must always be supervised and ensure that an adult is lighting them. It’s recommended that children under five should not have a sparkler. In addition, they also shouldn’t be used inside, or near other fireworks. If you decide to do a firework display at home, you need to plan. Check you have ample room for fireworks to be let off. Small fireworks need to be at least 5 to 8 metres away from your house while larger ones that are used in displays, should be at least 25 metres away from spectators. Remember to read all instructions carefully if you are unsure. When lighting fireworks, always ensure that you do so at arm’s length. And if it doesn’t go off, stay away from it! However, if they still haven’t gone off after half an hour of being lit, drench them with water and call the fire service for advice. It is also best to keep pets indoors to avoid them getting scared or injured by fireworks and bonfires. But most of all, have fun – and stay safe!